The synthesis, characterization and photophysics of a solution-processable metallopolyyne of platinum (P1) functionalized with the dioctyloxyphenyl-substituted thienopyrazine–thiophene hybrid spacer and its model molecular complex (M1) are described. Such metallopolymer P1 possesses a very low bandgap of 1.50 eV which extends towards the near-infrared (NIR) range of the solar spectrum, and represents one of the lowest optical bandgaps reported for metallopolyynes. With the capability of spanning a wider solar-radiation range, P1 can be used to fabricate efficient solar cells with power conversion efficiencies (PCEs) of up to 0.46% under air mass (AM1.5) simulated solar illumination. The electronic effect of the central heterocyclic ring sandwiched between the two thiophene units on the optical properties of these metallopolyynes has been investigated. The present study provides a good approach towards achieving conjugated polymeric materials with a broad solar absorption and demonstrates the potential of low-bandgap metallopolyynes for simultaneous visible and NIR light power generation. 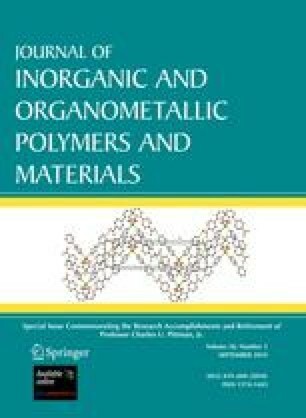 Dedicated to Professor Charles U. Pittman in recognition of his contribution to the development of organometallic polymers and materials. W.-Y.W. thanks a grant from the Areas of Excellence Scheme from the University Grants Committee of HKSAR, China (Project No. [AoE/P-03/08]) and a Faculty Research Grant from the Hong Kong Baptist University (FRG2/09-10/091). This research was also financially supported by the National Nature Science Foundation of China (50803051, 20974091) and the Scientific Research Fund of Hunan Provincial Education Department (06C827). We also thank Dr. A. B. Djurišić for the access of facilities for the solar cell fabrication and measurements.